Express Water – Reverse Osmosis and Under Sink System Replacement Filter Set – 30 Filters with Carbon (GAC, ACB) Filters and Sediment (SED) Filters – 10 inch Standard Size Water Filters by Express Water at N Online Agency. MPN: FLTSETC10G10S10. Hurry! Limited time offer. Offer valid only while supplies last. Make the purest drinking water with your own home system. Great in the kitchen: Improve the taste of your cooking, coffee, ice, and drinks. Make the purest drinking water with your own home system. Great in the kitchen: Improve the taste of your cooking, coffee, ice, and drinks. Experience safe filtered fresh tasting H2O. 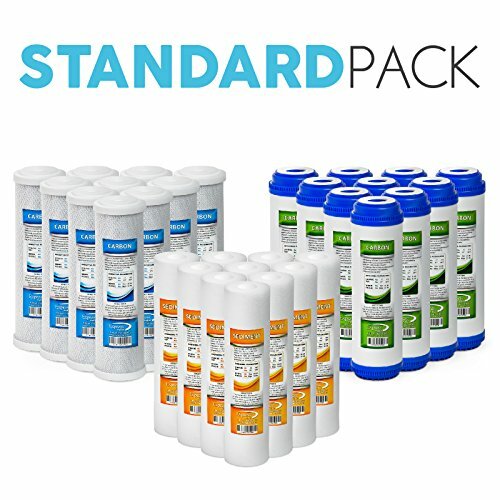 Removes up to 99.99% of contaminants including Lead, Chlorine, Fluoride, Cyanide, Giardia, Radium, Asbestos, Calcite, Heavy Metal, Bacteria, Viruses, Pharmaceuticals, and countless other contaminants. All filters in the 5 year half set are engineered to work together and compliment each other for long lasting high grade contaminant removal. This means you're getting the cleanest water and the best value in filtration. Fits any 10" inch filter housings. Best for house, apartment, residential, well water, industrial, rv, machine, and office uses. Certified by an independent laboratory to NSF standard 58. All filters are made from 100% food grade material. Operates on 40-80 PSI water pressure, you may need a Booster Pump or Pressure Regulator depending on your water pressure. The water is cleaner and more convenient than any pitcher, faucet filter, or countertop systems. Express Water's 5 Year Half Water Filter Set FLTSETC10G10S10 is the filter solution for your drinking water. Exactly what you need - Drink the healthiest water on Earth. All our filters are specially engineered to work together, producing the safest best tasting water you'll ever drink.